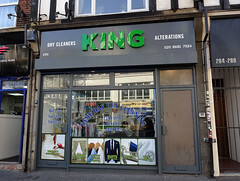 Dry cleaners on the High Street. According to the frontage as of December 2017, they also do repairs and alterations. It was previously known as Finest Touch photo, but was renamed to King some time between October and December 2017. Last edited 2019-02-07 15:28:40 (version 32; diff). List all versions. Page last edited 2019-02-07 15:28:40 (version 32).